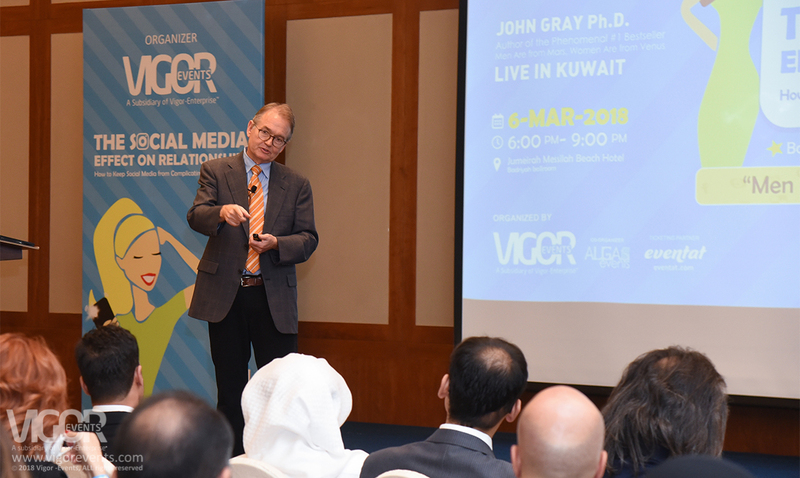 Vigor Events introduced to Kuwait a highly engaging seminar that focused on Relationships by Ph.D. John Gray who is conducting private and public seminars for more than 35 years, which was held on the 6th of March 2018 in Badriyah 2 Ballroom, Jumeirah Beach Hotel Kuwait. Who does not have a problem in communication at work or even at home? In fact, the different mindset of the opposite gender is always the problem that seems to be getting worse, not better. Answering this question requires moving beyond that by looking at the challenge more broadly. In this illuminating seminar, Dr. John Gray drew from his wide experience and daily faced situations how to understand and effectively communicate with others. In the morning session Dr. Gray started out the seminar by addressing how to build confidence and trust in a gender diverse team, creating more fulfilling and successful workplace by improving gender-divers team’s efficiency. Using this information, he guided participants through what they need to do to equip themselves to achieve their goals and how to make the workplace a source of fulfillment. And in the evening Session Dr. Gray addressed his talk more to the couples and discussed How to Keep Social Media from Complicating Your Relationship. Couples constantly distracted by Social Networking channels nowadays, we need new relationship skills to support positive moods, sustained energy and most importantly, focus. Dr. Gray Approached Modern ways for men and women to manage stress more effectively, Creating positive relationships through understanding the differences between men and women, overcoming the social media negative obstacles to finding your soul mate and awakening your soul connection. The 2 sessions Seminar was tailor-made for all successful professionals who want ascertain what exactly they want, and possess a guide to assist them remove any obstacles. And to all the individuals who are aiming to know more about getting their relations on the right track. The event is organized by Vigor Events, Co-organized by ALGAS Events.